Led lights bars provide additional automotive lighting when you need it. 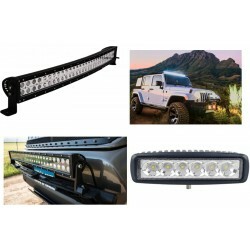 Great for use as reverse lights, work lights or when hunting. You are buying 1x 12W led deck/spot light.It can operate on both 12 and 24v and makes a great wo..
You are buying 1x 180W led spot light. Comes with brackets that can be easily adjusted and ..
You are buying 1x 18W led flood light. It has special lens to give a combination of flood a..
You are buying 1x 240W led flood/spot light. With a free wiring harness & switch value of..
You are buying a pair of lights (2x lights) Comes with brackets that can be easily adjusted.Gre..
You are buying a pair of lights (2x lights) Red ring only in stockComes with brackets that can ..
You are buying TWO 18W led flood/spot lights. It has a combination of flood and spot leds so yo..
2x HID Spot Lights 55W 7"
You are buying one pair. (2x lights) 55W HID spot lights. 7" Lens with removable pol..
You are buying 1x 48W led flood/spot light. This is semi focused but it is mostly used as a..
2x Adjustable Off Road Lights Mounting Brackets Clamps for Bull barsAvailable in 3" and 2½"Package i..
Makes for an easy install of led lights. This one has a dual outputs for use with a two l..
Makes for an easy install of led lights. This one has a single output for use with a a single l..
You are buying 1x rocker switch.This is great for my led light bars. It can handle 20A ..